Over 7,500 students are eligible to graduate from the University of Southampton this summer. The University of Southampton is welcoming visitors from around the world during its 2018 summer graduation ceremonies (18-27 July). Over 7,500 students are eligible to graduate this year, receiving undergraduate, postgraduate and doctoral awards. All of the ceremonies will be held on the University’s Highfield Campus in the Turner Sims concert hall and the Nuffield Theatre. Amongst those participating in the ceremonies are Pro-Chancellors and Southampton graduates Jon Sopel, the BBC’s North America Editor and Colin Smith, former Director and Group President of Rolls-Royce and Chair of UK Industry Aerospace Growth Partnership. This year, the University will honour its first graduates to undertake a medical undergraduate degree delivered jointly in the UK and Germany. The BM (EU) is offered in conjunction with the Kassel School of Medicine at Gesundheit Nordhessen Holdings, a German healthcare provider. Joining them are the third group to complete their studies via the University of Southampton Malaysia. These students spent the first two years of their MEng programmes in Mechanical Engineering and Electrical & Electronic Engineering at the University’s campus in Malaysia before transferring to Southampton for a further two years of study to finish their degrees. 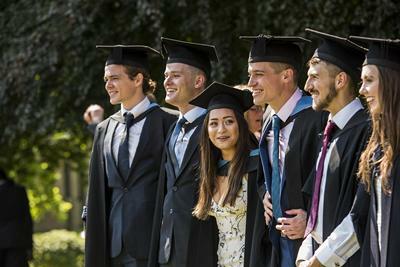 “Graduation is one of the most exciting and important times of the year and on behalf of the University I would like to congratulate all our graduating students on their significant achievements,” said Professor Sir Christopher Snowden, Vice-Chancellor and President of the University of Southampton. “I also want to thank all of the staff at the University for their support and commitment in helping our students achieve their success,” Professor Snowden continued. “I am very aware of how important pastoral and academic support is to students and I am sure that most graduates have at least one member of staff who made a special difference to their time here at Southampton. Professor Tony Hey (Honorary Doctor of Science) – Professor Hey is Chief Data Scientist at the Science and Technology Facilities Council and a former Head of Department and Dean of Engineering at the University of Southampton. Also lead the UK’s ground-breaking eScience initiative and was Vice-President responsible for Microsoft’s global university research engagements. Professor Lord Patel (Honorary Doctor of Science) – Lord Patel has an outstanding international reputation for his work on mental health, alcohol and drug use, and in identifying the health and social care needs of a broad range of vulnerable people and communities. He has worked at the highest levels of government across Communities and Local Government, Health, and the Home Office. Dr Grahaeme Henderson (Honorary Doctor of Science) – Dr Henderson is Vice-President, Shipping and Maritime at Shell International Trading and Shipping Company Limited and a leading spokesperson globally on safety and the environment, improving the efficiency of shipping and maritime operations, and driving technology and innovation. A Southampton graduate (Civil Engineering), Dr Henderson is also an Adjunct Professor at the University. Professor Subra Suresh (Honorary Doctor of Science) – Subra Suresh is President and Distinguished University Professor at Singapore’s Nanyang Technological University. His research into engineered and biological materials has led to scientific discoveries and technological applications at the intersections of engineering, sciences and medicine. Professor Dame Jane Francis (Honorary Doctor of Science) – Dame Jane Francis, Director of the British Antarctic Survey, is a graduate of the University of Southampton (Geology). Her research into ancient climates and fossil plants from the Arctic and Antarctica, used to decipher ancient polar climates of the past. She was awarded the Polar Medal by HM The Queen for her contribution to British polar research. Dr Brian Bowsher (Honorary Doctor of Science) – Dr Bowsher recently retired as Chief Executive of the Science and Technology Facilities Council (STFC), the UK’s Research Council for particle physics, nuclear physics and astronomy. A Southampton graduate (Chemistry), Dr Bowsher previously served as Managing Director of the UK’s National Physical Laboratory (2009 – 2015). All of the University of Southampton’s graduation ceremonies will be streamed live via the internet. Click here to join in this year’s celebrations.